If you’ve been searching for a bed online, chances are you’ve come across the Purple mattress. Featuring a combination of supportive foams and the brand’s special hyper-elastic polymer smart grid (more on that later! ), this bad boy is truly unlike anything else on the market. However, does uniqueness alone make for a comfortable mattress? I won’t know until I put the Purple to the test, seeing how it’s built and how it sleeps so I can figure out if it might just be the bed of your dreams. Short on time? Click here to jump to my review summary. 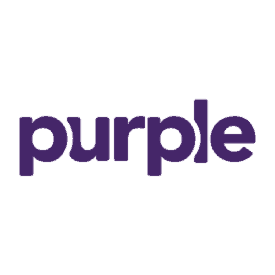 Purple was founded in 2016 by a pair of brothers (Tony and Terry Pearce) who wanted to disrupt the way beds were made and sold. While other disruptors in the space have traditionally relied on making modifications to pre-existing mattress materials (like memory foam, latex, and pocketed coils), this duo decided to ditch the old and come up with something new: Purple’s Hyper-Elastic Polymer™ Smart Comfort Grid™, a material first developed by the pair in the 90s. You’ve likely seen this bright, purple grid featured in the brand’s many ad campaigns, which demonstrate its capacity for bounce, stretch, and pressure relief. We’ll dig more into the grid’s specs below, but it’s safe to say there would be no Purple brand without this iconic material. Later on, we’ll compare the Purple to some of its biggest competition, namely the Casper and Nectar, two all-foam beds that drive sleepers positively wild. Afterward, we’ll also see how the Original Purple sizes up to the brand’s other beds, the Purples 2, 3, and 4. But before we get into all that, let’s turn our attention back to the mattress of the hour! What is the Purple Made of? Any mattress review needs to begin with what’s going on underneath the covers, so let’s take a magnifying glass to the Purple’s construction. Here, you’ll find a nearly 10” structure comprised of three distinct layers: the aforementioned hyper-elastic polymer smart grid as well as two support sections of high-density poly foam. This combination of materials makes for a bouncy yet pressure-relieving structure aimed at providing targeted comfort no matter the position. Cover – The cover is made up of a blend of Polyester, Viscose and Lycra. It’s a soft, breathable fabric that’s thin to allow airflow into the mattress. Lycra is a stretchy material often found in athletic clothing, so helps with temperature regulation by wicking moisture away from the body. Comfort Layer – This layer is made up of 2” of the hyper-elastic polymer smart comfort grid we discussed earlier. While the springy material has a quick response to pressure, the individual polymer squares are designed to collapse under the weight of your body, producing a sort of quasi-contouring feel. 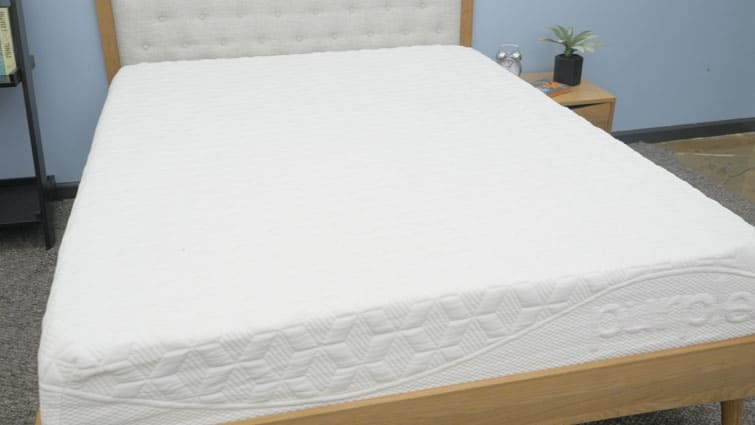 This creates an interesting interplay between pressure relief and support that’ll give you some satisfying comfort without leaving you feeling too stuck in the bed. I should add that this material is built to be “temperature neutral,” as the open-grid design encourages plenty of airflow for cooling and breathability. Transition Layer – Directly below the comfort layer, you’ll find 3.25” of poly foam, which functions to transition the sleeper from the comfort layer up top to the foundation below. The firmness here contributes to the overall “on top of the bed” feel you get from this mattress, which tells me it could be a great fit for combo sleepers who need to move around and change positions throughout the night. Base Layer – And finally, the base of the mattress, which is built with 4” of high-density poly foam. This firm layer acts as the foundational support of the mattress and gives the bed its structure and shape. How Firm is the Purple? Now that we’ve got the construction specs figured out, let’s take a moment to talk about the Purple’s unique firmness and feel. Pressing my hand into the mattress, I was struck by how the smart grid collapsed under my fingers. I thought it’d be firm, but the squares actually conformed to my body for some satisfying pressure relief. However, this definitely doesn’t feel like the contouring you’d get from a softer material like a memory foam; here, the give is coupled with a distinct springiness that lifts you up and out of the bed no matter how hard you press into the structure. But we’re not here to just talk about hands, so let’s hop onto the mattress! Though I think pretty highly of my own opinion (wink wink), I think any conversation about firmness needs to involve a few different voices. Why? Because everyone feels a bed differently, so while I might think a certain mattress is super soft, another person may find it hard as a rock. The graphic you’re about to see, then, represents the average firmness rating compiled from myself and three of my coworkers. 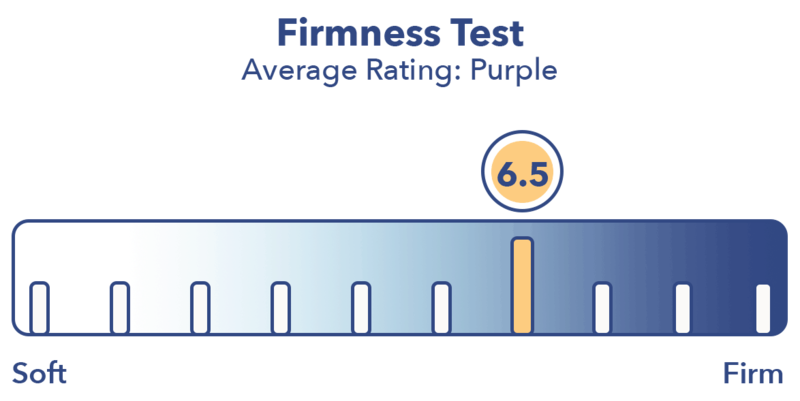 We were all pretty much in agreement about the firmness of the Purple mattress, hovering somewhere between a 6 and 6.5 on the firmness scale (with 6.5 being the industry standard for medium firmness). What this tells me is that this bed hits the sweet spot between firmness and softness. I personally gave the bed a 6, as I found its top layer of hyper-elastic polymer to be quite gentle. As I rolled around on the mattress, I could feel the grid adapting to my body no matter the position, which resulted in some satisfying pressure relief. However, while there is a tiny bit of sinkage through this top grid, you’re not likely to feel stuck in the mattress at all, which affirms my earlier notion that this could be a fantastic fit for combo sleepers. Side sleepers, on the other hand, may find the mattress to be a touch too firm. Also worth noting is that you can actually feel the air moving through the smart grid as you roll around on the bed, which tells me this mattress should indeed sleep cool (or “temperature neutral” as the brand claims) through the night. Another important component of a bed’s feel? Pressure! For this assessment, I’m going to explain how the Purple alleviates tension at sensitive spots along the body (namely the hips, shoulders, and lower back). But I won’t just be doing this with words — I’ll be utilizing a pressure map to help me out! As I stretch out on the map, a computer app will simultaneously create a graphic showing how my body’s interacting with the bed. On the image below, you’ll see this on a gradient from blue (indicating low pressure) to red (indicating high pressure). Back: Lying on my back, my weight was pretty evenly distributed across the surface of the bed. 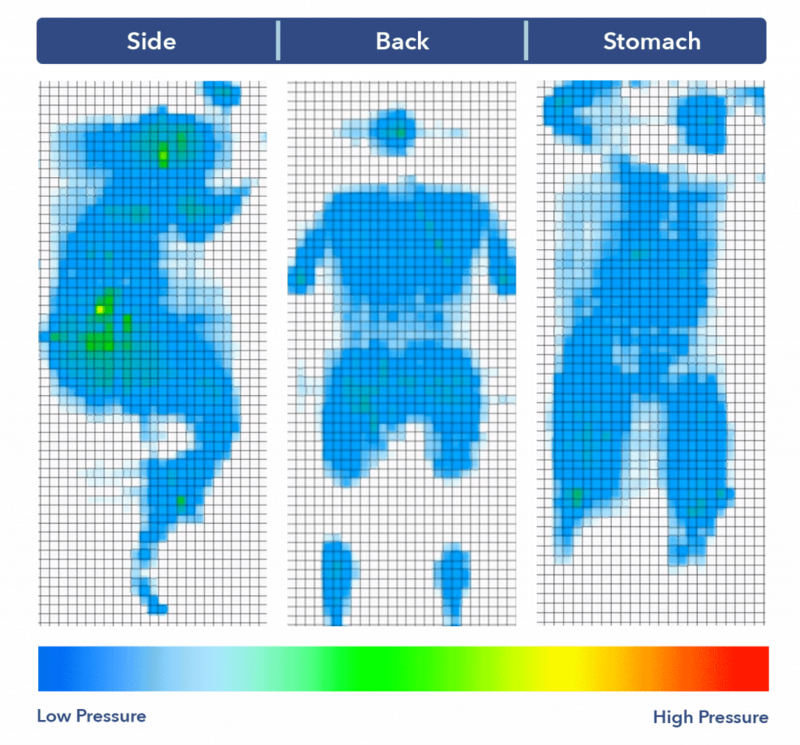 As I sank into the comfort grid, I could feel the hyper-elastic polymer adapting to my body and filling in the space at my lumbar region for some satisfying pressure relief (as you can see in all the blue in the graphic above). I should also mention that it was easy to move around and change positions. Side: Rolling onto my side, the pressure relief continued as the smart grid contoured to my shoulders and hips, typical problem areas for side sleepers. While there’s a lot of comfort to be found in the lateral position, I’d say the Purple is probably best for combo sleepers who switch between their backs and sides as strict side sleepers may find it just a bit too firm for their liking. Stomach: Once I flipped onto my stomach, I began to feel some slight discomfort and pressure. Though the hyper-elastic polymer smart grid is likely to keep you positioned on top of the bed, I still found my hips sinking somewhat out of line with my shoulders in this position. This isn’t great for prone sleepers, who need to keep the spine in a healthy, neutral alignment. While the Purple may be a one-of-a-kind product, that doesn’t mean it’s not vulnerable to some healthy competition. In fact, there are two brands that give this brand plenty of quaking to do in its violet-hued boots: Casper and Nectar. Below, I’ll break down the most striking similarities and differences between these different bed. 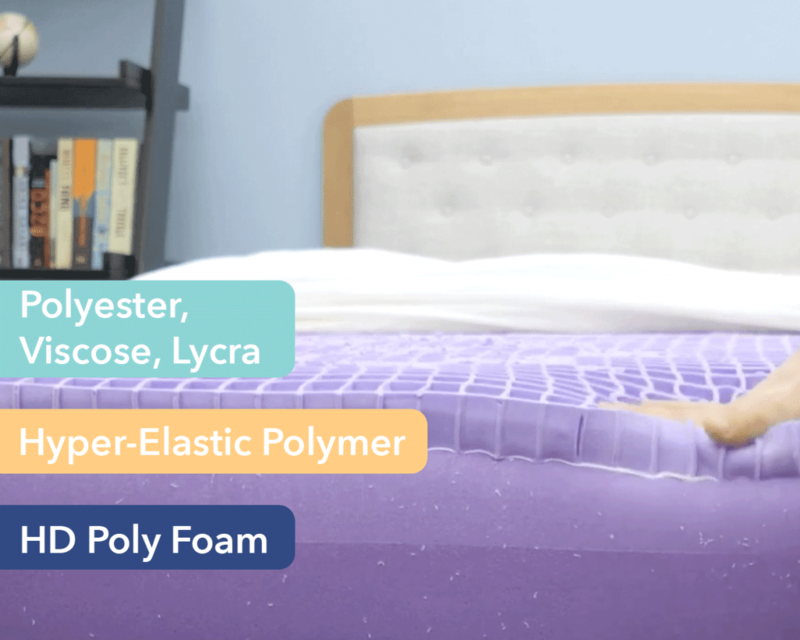 Unlike the the Purple, the Casper is built entirely of foam and has a more balanced feel thanks to its combo of latex, memory foam, and high-density poly foam. The Casper also features some great Zoned Support, which provides extra firmness at the hips and cushiony softness at the shoulders. When it comes to price, these two are evenly matched, with a Casper Queen coming in at $995 and the Purple Queen rounding out to $999. For more, you can check out my full review of the Casper mattress. Where the Purple features a tall section of hyper-elastic polymer in its comfort layer, the Nectar opts for thick layers of memory, which results in deep body contouring and pressure relief. While the Casper and Purple are great for combo sleepers, the Nectar is best suited for strict side sleepers who need to sink in for some satisfying cushiony support at the shoulders and hips. Of the three listed here, the Nectar is the least expensive, costing $699 for a Queen size. Is your interest piqued? Head on over to my full review of the Nectar. Not only does the Original Purple have to compete against other brands in the bed-in-a-box space, it also has to square up with its sister beds the Purples 2, 3, and 4. While the Old and New versions of the Purple are similar(ish), there are some important differences to point out between them. You’re also more than welcome to check out my full assessment of the New Purple mattresses. The New Purple models have the same hyper-elastic polymer grid in the comfort layer as the Original Purple, but they feature varying levels of the stuff: two inches for the Purple 2, three for the Purple 3, and four for the Purple 4. In this way, the beds act as a sort of gradient from firm (Purple 2) to gentle (Purple 4). Regardless of the firmness, however, all three beds are extremely bouncy thanks to a layer of pocketed coils in the base. Price-wise, they’re also significantly more expensive than the Original, with Queen sizes ranging in price from $1600 – $2,800. 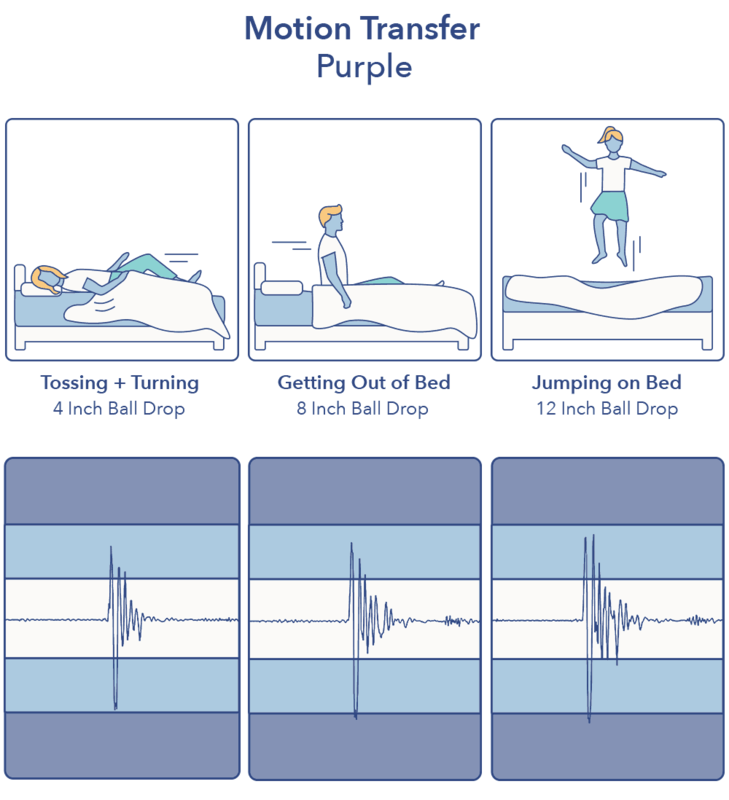 Now that we’ve sussed out Purple’s biggest competition, let’s get back to the bed at hand by talking about its motion transfer. This test is designed to indicate the amount of movement you’re likely to feel from one side of the bed to the other when, say, your partner gets up in the morning or your furry little pooch hops in at night. 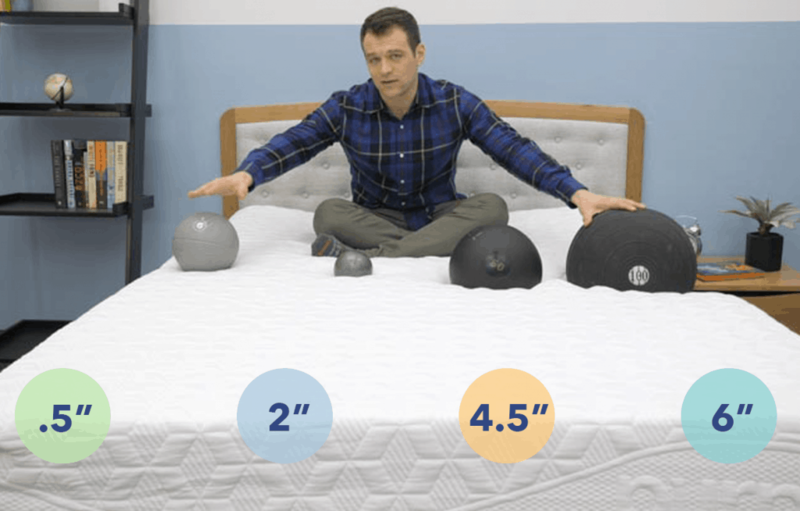 To assess this, I dropped a 10 lb steel ball from heights of 4 inches, 8 inches, and 12 inches and measured the disturbance on the other side of the mattress using a seismometer. This should be pretty intuitive: the bigger the lines, the bigger the disturbance. Considering how bouncy the Purple is, I’m not too surprised by these results, which tell me that you’re likely to feel motion transferred pretty easily throughout this bed. However, the spikes aren’t as dramatic as I thought they would be, so may not be a dealbreaker for you, depending on your sleep preferences. And finally, let’s wrap up our tests with one focused on sinkage, or the amount you’re likely to sink into the bed. This can be an important section for those of you who want to know whether you’re more likely to be positioned “on top” of the mattress or “in” it. To figure this out, I placed four balls of varying sizes and densities (a 6 lb medicine ball, a 10 lb steel ball, a 50 lb medicine ball, and a 100 lb medicine ball) on top of the bed and measured how deeply into the structure they sank. As I suspected, these measurements tell me you’re not likely to sink too far into the Purple mattress. While there’s a bit of give through the top layer of hyper-elastic polymer, the firm support of the high-density poly foam in the base coupled with the bounce of the smart grid is bound to leave you feeling more “on top” of the bed than “in” it. After sizing up all the various aspects of the Purple mattress, I’m ready to dole out my general recommendations and complaints for the bed. If you need to sleep cool, you could find a lot to love in this mattress. Designed to be “temperature neutral,” the smart comfort grid combined with the moisture-wicking cover work to combat overheating at night. The buoyant lift of the Purple could also make it an excellent fit for combo sleepers who need to move easily between positions while they slumber. 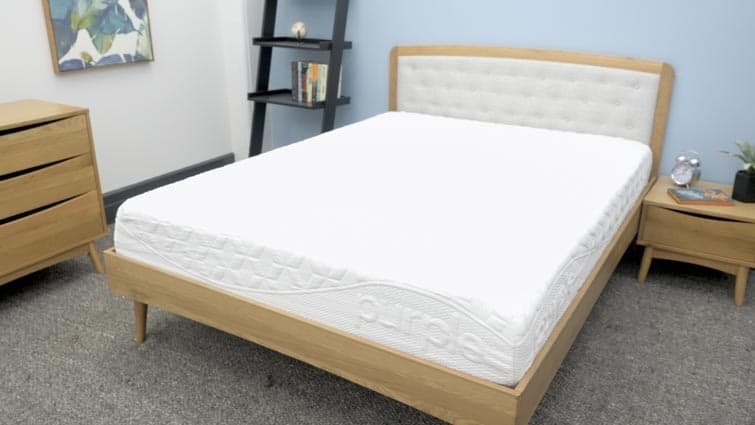 And finally, one of the biggest pluses of this mattress is its tremendous bounce, which could be great for those of you on the prowl for some extra mobility. 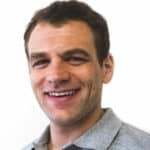 While the hyper-elastic polymer smart grid is built to provide pressure relief to the shoulders and hips, you’re not going to get the body contouring here that you would on something like a memory foam mattress. Additionally, the grid makes for a quasi-“waterbed” feel, which may not be the most ideal vibe for those sleepers after something more traditional. Sleep Trial: 100 night trial period. Shipping: Shipping is free and the mattress will arrive compressed in a box. If you’re convinced the Purple is the right bed for you, make sure to check out all its sizing and price info below!